Serving Wylie, Texas and the surrounding areas since 1999. For an interactive map, please click on the image above or on this link. 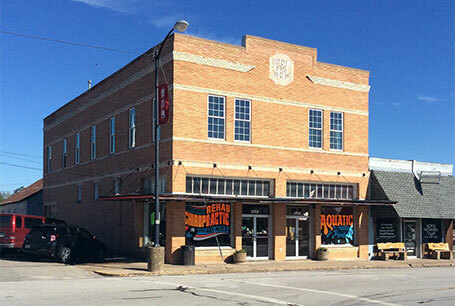 Located in in Historic Downtown Wylie, Texas at the intersection of Ballard Avenue and Oak Street across from Olde City Park. We are located on the second floor - come to the side entrance and take the elevator. Patients from all over Wylie, Murphy, Sachse, Garland, Lavon, Rowlett, Nevada, Josephine, Farmersville and Greenville come to us for expert sports injury rehabilitation for the highschool football player and the weekend warrior and for aquatic therapy on joints and muscles. Let our Chiropractor and Rehab Assistants with sports medicine expertise provide relief from conditions such as: Headache, Arthritis, Fibromyalgia, Carpal Tunnel, Radiculopathy, and Whiplash. Massage is also available on site as well as Wellness Program and Spinal Adjustment.